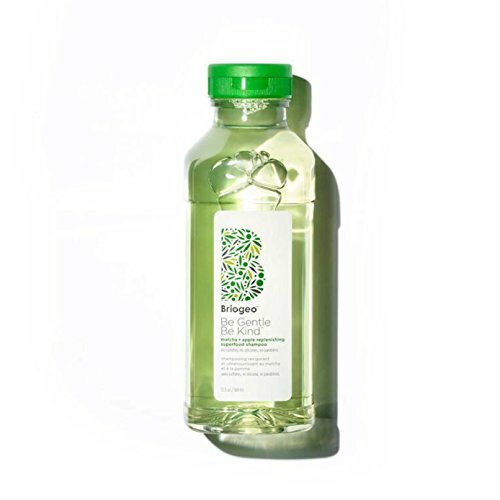 GREEN JUICE INSPIRED SHAMPOO FOR A HEALTHY SCALP AND HAIR: Briogeo's Be Gentle, Be Kind Matcha + Apple Replenishing Superfood Shampoo is specially formulated for those with dry, lifeless, and dull hair that are looking to supplement a healthy diet with a parallel hair care regimen. This nutrient-rich, green juice inspired shampoo hydrates dry hair and replenishes dull, lifeless strands with daily nourishment for healthy-looking hair. PACKED WITH POWERFUL NATURAL INGREDIENTS: By harnessing the power of fruit and vegetable fatty acids, vitamins, and minerals, this sulfate-free shampoo helps to support the vibrancy and strength of hair with an added punch of hydration. It contains a supercharged boost of matcha, a rich source of antioxidants, and procyanidin-rich apple to help protect and promote healthy hair. ADDITIVE AND CRUELTY-FREE: Briogeo is proud to say that our Superfood Shampoo is 98% naturally derived. Specially formulated, this sulfate, silicone, and paraben free shampoo does not include phthalates, DEA, or artificial dyes. It's certified gluten-free, cruelty-free and suitable for vegans so you can feel good about looking good! For best results, pair with the Be Gentle, Be Kind Kale + Apple Replenishing Superfood Conditioner. PERFECT FOR TREATED HAIR: The incredible ingredients in this hair replenishing shampoo make it the ideal product for cleaning and hydrating treated hair. Whether you routinely color your hair or use a keratin or chemical treatment, the unique blend of natural ingredients will help keep your hair looking and feeling its best!